The rush to update all fairy tales in the wake of Tim Burton's Alice In Wonderland has come full circle, completing a magical journey that should then be remade with digital effects, grittier action, and possibly a no-nonsense female cop, as according to contemporary sensibilities. 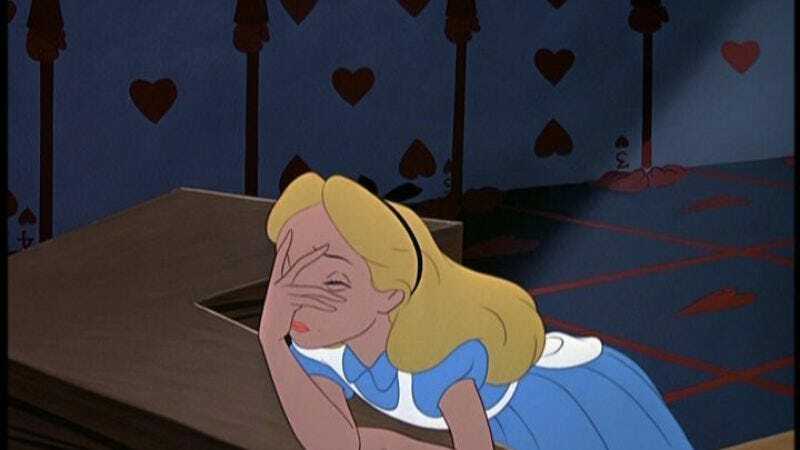 The CW is now developing Wunderland, a McG-produced, very-2012 take on Lewis Carroll's tale that will recast Alice as a detective who discovers a secret, fantastical underworld just below Los Angeles, where deceptive, delusional, self-serving creatures speak in an invented language and engage in petty battles over nothing, and then also there's an Alice In Wonderland world underneath it. The drama is part of a recent rash of modernized fairy-tale dramas and procedurals—not only Once Upon A Time and Grimm, but also Fox's Sleepy Hollow, in which Ichabod Crane, yes, partners with a female cop, and an in-development, modern take on Peter Pan's Lost Boys (a story that would seem to preclude any no-nonsense female cops, so maybe don't count on it). And of course, Wunderland is strikingly similar to both The CW's upcoming Beauty And The Beast reboot, in which a female cop also discovers a fantastical underworld, and ABC's recent toying with a procedural from Kings creator Michael Green, in which another female cop discovers another fantastical underworld living beneath New York. So, should you be looking to sell a TV show today, maybe consider flipping to a random page of Grimms' Fairy Tales and just pasting a photo of Mariska Hargitay in there.